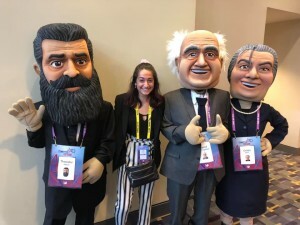 I Brought My 14-Year-Old to AIPAC. Here’s What Happened. What are you teaching your children? I mean – what are you really teaching your kids? As I focus on teaching Jewish values to my own kids, it is vital that Israel be one of them. I want my children to know Israel, support Israel, wrestle with Israel and love Israel. To me, this relationship is about familial love and respect, peoplehood and a shared sense of history, legacy and destiny. It’s even about inquiry and critical thinking. Israel is part of us. Part of that support means paying close attention to the Israeli elections, following SpaceIL’s lunar expedition and being at the largest gathering of pro-Israel activists in the world (outside of Israel) – which takes place at the AIPAC Annual Policy Conference. I spent 14 years as the Pacific Northwest Regional Director for AIPAC, the American Israel Public Affairs Committee, and I want my kids to know that AIPAC exemplifies the very best of American citizenship. Those who demonize AIPAC by claiming they “buy votes,” or vilify Israel supporters as having “dual loyalty,” place every single Jew in their cross-hairs with those anti-Semitic tropes, whether they’re an AIPAC supporter or not. It is our democratic right as Americans to advocate for what we believe in, and our obligation as Jews to do so, and there is no single lobbying organization that does it better than AIPAC. AIPAC is bipartisan, made up of progressives and conservatives; AIPAC does not endorse politicians (in the US or Israel); and AIPAC gives no money to politicians here or there. AIPAC’s budget is actually teeny compared to other lobbies, ranked 147th in spending behind even the American Association of Airport Executives! But while AIPAC’s budget is small, it has a huge responsibility: ensuring America’s leaders stand with the only country in the Middle East that respects women and minorities’ rights, promotes religious freedom and freedom of the press, and protects free speech. Israel is far from perfect and its leaders are flawed, but can we honestly look at America and say our beloved country is any different? Despite Israel’s imperfections, as the only Jewish State in the world, she deserves our support. First, she loves doing Jewish stuff. She chooses to be a part of BBYO; she goes to Jewish summer camp; she is a part of the Jewish Teen Foundation; and if she weren’t so darn busy, she’d likely continue mentoring younger Jewish kids at our synagogue. Third, she has had a strong Jewish education. She spent her K-8 years at a Jewish day school; we do Shabbat dinner every Friday night so she knows the blessings, songs and stories; she chose to have a traditional Bat Mitzvah and, during her training, she learned how to chant Torah as well as lead the prayer service. My daughter is now a freshman in high school, and for the first time since she was three years old, she’s not at a Jewish school. She is confident in her Jewish identity and is confident in her love of Israel. But she’s not a little girl anymore. She knows that Israel is not perfect – just as America isn’t perfect – so I am not worried that exposing her to the complexities will drive her away from Israel. To the contrary – I hope it will give her a more mature love for this place we call our Homeland. Because we live in the Bay Area, of course she’s been exposed to plenty of criticism of Israel. And because of the nature of our family, we talk openly about these issues. I don’t believe we do ourselves any service by brushing under the rug the less flattering side of Israel. However, it was time for me to start digging in deeper with her, and the AIPAC Policy Conference was the perfect place to do just that. It began as we were walking into the convention center and saw Orthodox Jews protesting against not just AIPAC but the existence of the State of Israel. They were standing near religious Christian fanatics who held signs claiming Jews killed Jesus and that we are going to hell. She was surprised by the Christian protestors but she was really shocked that Jews would be advocating for the end of Israel. (Frankly, I was surprised not to see young Jewish kids from IfNotNow protesting this year. I was ready to explain that situation to her, but was able to defer it until later in the day when it came up.) I explained that the Neturi Karta sect of Orthodoxy doesn’t believe Israel should exist until the Messiah arrives. At the opening plenary, we immediately heard from some big-name speakers who brought up some big-deal issues, like BDS. We’d talked about BDS before, but now it seemed like she was hearing the term for the very first time. So, it gave me a chance to explain to her about BDS, and how it was founded to end Israel as a Jewish State, making it an anti-Zionist and anti-Semitic movement. This conversation had added value because it prepared her for later in the day when a dear friend said that with Benjamin Ganz and Benjamin Netanyahu speaking at AIPAC this year, maybe the proper headline for the story should be: “It’s all about the Benjamins.” She laughed appreciatively at the joke. We talked about Bibi, the investigation, the upcoming election, and his political coalition. She wondered how to support Israel’s democratically elected leadership even if they’re partnering with extremist political parties. I explained that the nature of Israel’s coalition system means that any leader will always feel like they’re being held hostage at moments by the fringe minorities that only have a few seats but could topple the government by leaving the coalition at any moment. 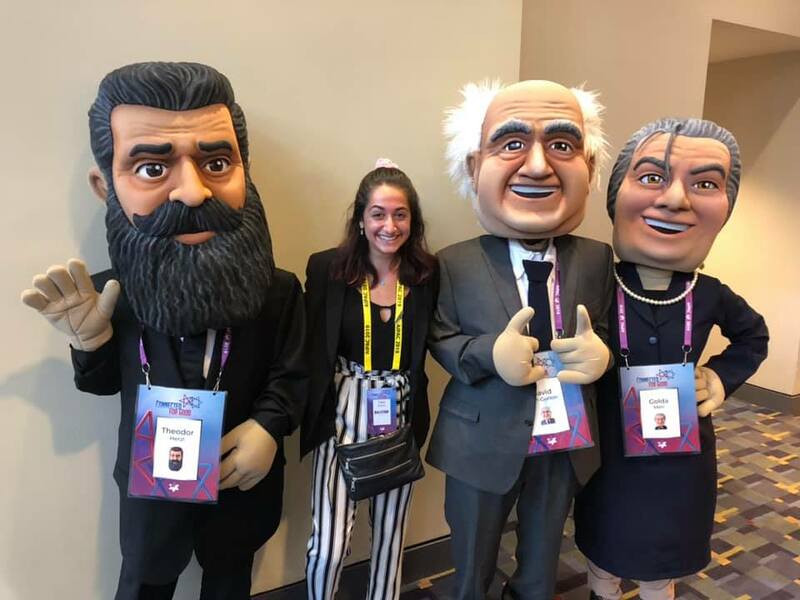 At each of the major plenaries and many of the breakout sessions, people of different races, religions, and ethnicities spoke about their own respect for Israel and appreciation for AIPAC. And each time, when a speaker would say they weren’t Jewish, my daughter would be surprised. She just assumed that all the speakers – no matter what they looked like – were Jewish. This was a double-surprise for me. First, I was surprised that she didn’t understand why non-Jews would also love the Jewish State. So, we discussed the reasons, though the speakers themselves did a better job of sharing their “why” than I could ever have. Second, I was pleasantly surprised that she felt intuitively that Jews could be any color. She didn’t see an African American, Asian American, or Hispanic American and assume they weren’t Jewish; she assumed exactly the opposite (which made me very proud of how far the Jewish community has come in America). In between sessions, we walked the halls with the 18,000 other attendees – including 4,000 students – and of course we both bumped into old friends. She was a good sport every time I stopped to schmooze, but she even ran into friends from Camp Ramah and BBYO. We ended the day in the AIPAC Village, where there is an enormous exhibition fair that takes up the entire footprint of the convention center. There are lounges, eating areas, and charging stations, but there are also organizations showing off what they do. An innovation showcase shows off Israel’s inventions that are changing the world. An actual Iron Dome battery stands 20 feet high in one corner, while an Israeli ambucycle stands in another. Virtual reality gives participants an opportunity to see Jerusalem, feel what it’s like to be a volunteer medic, and travel in time. Booths show off Israeli tikkun olam work from SAHI, an organization that helps at-risk kids in Israel, to OneFamily, an organization that helps families of victims of terror, to IsraAID, an organization that sends relief workers around the globe to help in disaster areas. My daughter signed up to volunteer for IsraAID. The day began with news of the rocket attack from Gaza and learning that Prime Minister Netanyahu had gone back to Israel. However, it seems that before he left, he had time to meet with President Trump, who signed a letter officially recognizing the Golan Heights as Israeli territory. This led to what became the major theme for the day: how do you applaud the right decision, even if it’s from the wrong decision-maker? We heard from Vice President Mike Pence and asked each other: How do you honor the office and not the office-holder? We heard from Secretary of State Mike Pompeo and my daughter wanted to know: How can she loathe Trump as a person and disagree with so many of his positions, but support his actions when it comes to Israel without compromising her good progressive credentials? We had to decide whether to clap or not when certain speakers spoke. We had to decide whether the stand or not when certain statements were made. We had to decide how we felt about the audience’s reaction to highly partisan statements. And in each case, we had to decide how to differentiate between the message and the messenger. This led to more discussions: about our challenges with the UN, the extreme partisanization of Israel in America, and intersectionality. My daughter really wanted to know how we can partner with people and organizations that share an admirable, common goal, even while they’re willing to partner with other people and organizations that are anti-Semitic. She wanted to know if it’s more effective to fight the fight from within, or fight from the outside – whether that’s the UN Human Rights Council or the British Labour Party. The questions over the course of the day became tougher, and I found the answers were becoming more and more nuanced. By far, the most formative experiences at the conference for my daughter came when we witnessed so many strong women proudly standing up for Israel and AIPAC. We saw a panel on the main stage with two women senators, one Democratic and one Republican, who were both veterans of the US military. Senators Tammy Duckworth and Martha McSally both proudly declared their support for Israel. We saw Ambassador Nikki Haley, who received the largest and longest-lasting standing ovation of any speaker, talk about her time at the UN and how much pride it gave her to stand with Israel in the face of all the criticism. We heard from the first openly bisexual Senator, Kyrsten Sinema, a Democrat from Arizona, who explained how it was an easy decision to vote against the Iran Deal when she was in the House, despite President Obama pressuring all the Democrats to vote with him. We heard from the woman who chairs the group “Labour Friends of Israel” in Britain, MP Joan Ryan, who bravely left the Labour party because of Jeremy Corbyn’s horrible anti-Semitism. At the breakout panel on “Feminism and Zionism,” we heard from four women: a Christian lesbian, a Mexican-Jew, an Ashkenazi woman from the Bay Area, and an African American woman. They were all so proud to be progressive feminists and Zionists. We met Amanda Berman, the founder of Zioness, and my daughter got to take a picture with her. As we walked to the hotel room late last night, my daughter proclaimed to me that she wants to be an activist like those women when she grows up. She said that’s what she wants to do with her life, and I am not sure who beamed more proudly at that statement – her or me. I learned several important lessons on this trip. First, I realized that as parents we can say things to our kids 1,000 times, but they will only actually hear it when it’s said by someone else. We’d talked about half these issues before, but only when others mentioned them did she hear them for the first time. My sister-in-law says, “More gets caught than taught.” It’s one thing when we say something, but it’s another thing altogether when we do something. Bringing my daughter to AIPAC allowed her catch so much more than I could have ever taught her back home. Second, I learned that perceptions really can change from one generation to the next. The way she sees the world around us is totally different than the way I do – and I’m not just talking about technology and social media. Her assumption that Jews really can be any race or ethnicity is visceral. My generation knows that of course, but I definitely wasn’t raised feeling it in my kishkas the way she does. Finally, I learned that a father-daughter trip like this is priceless. I’ve been to 18 AIPAC Policy Conferences, but this was by far my favorite because of my company. Enjoying three days together – and bonding over substantive issues and not just hanging out at a dude ranch (which is also cool) – was so special. I’m committing to bring her every year, if she’s up for it. And in a few years, when my son is a freshman, I’ll bring him too. Judaism commands us to teach our children (Deuteronomy 6:7). Teach them our values, our traditions and our stories. Teach them where we come from and where we are going. Teach them how to embrace and struggle with our Jewish identity. Teach them why loving Israel is important, so they can figure out why it is meaningful for themselves. My trip to the AIPAC Policy Conference this year did just that. 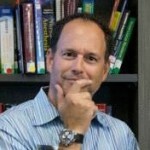 Zack Bodner spends his days as the CEO of the OFJCC and his late nights waxing poetic on the Live Fully Blog. During the in-between hours, he and his wife ro-sham-bo for who does the dishes and who puts each of their three kids to sleep. On the weekends, Zack schleps his brood from soccer to baseball to drama to dance and then back to soccer. He can often be found asleep in one of his kids' beds after reading bedtime stories to them.